This Post has already been read 580 times. Infinix, the online-driven smartphone brand is launching another device in the HOT series, the HOT 7. Infinix is well-known in emerging markets where it has a reputation for high performance devices at a relatively low cost. HOT 7 has set entertainment as the brand tone for the HOT series, which has a large-screen, large battery and Dirac mode speakers. It is an upgraded smartphone for optimized performance and available for purchase at Daraz.pk at a price of PKR 14,999. 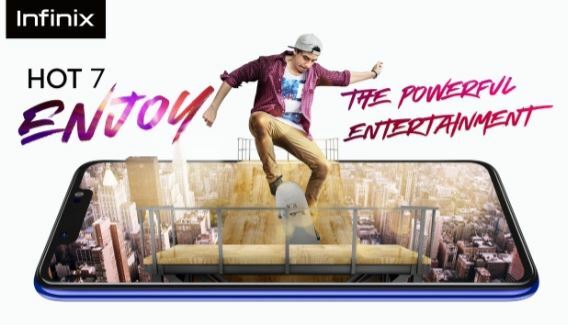 Known for stylish designs, Infinix introduces Hot 7 in four color schemes: Midnight Black, Champagne Gold and the first gradient design – Cosmic Purple, Infinix HOT 7 is a top choice for a powerful entertainment experience. Please visit the official Infinix website www.infinixmobility.com to learn more.